Go off the beaten track and discover places where no tour bus can go on this full day trip into the scenic Taurus Mountains. 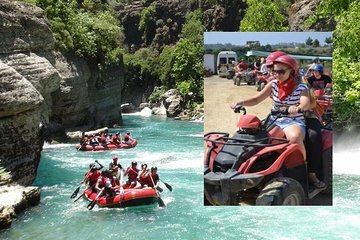 Take your all-terrain quad-bike through mountain villages, down forest paths and into the Köprülü Canyon, exploring the picturesque mountain landscape from the driver’s seat. After your driving adventure, kit up for a thrilling white-water rafting expedition down the Köprülü River, braving the river rapids along the way.